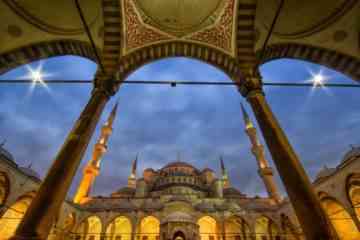 There are certainly many underrated cities and places in all the world. 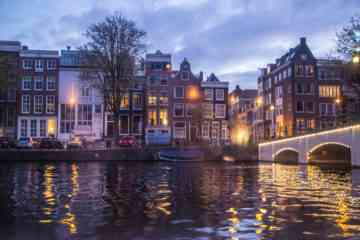 How does one choose among the best destinations in Europe to pick one as the most underrated? 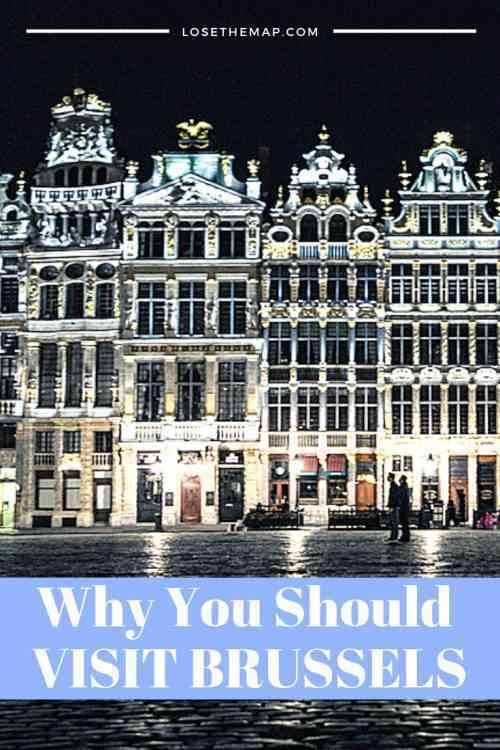 This was my criteria: the difference between my expectations and the things I had heard about Brussels, as opposed to the reality I experienced there, made it the most underrated city in Europe I have visited so far. Brussels may not have the quintessential wide river flowing through its center, or a classic European castle in its skyline (though you will find some outside the city). Instead, it has a surplus of beautiful, quirky, fun, friendly, and charming corners to discover. Thanks to Rail Europe for taking me on an amazing journey around northwestern Europe, including my new favorite city of Brussels. Though this visit was part of a press trip, all opinions below are, as always, my own. If you want to save this article for later, or share, Pin away! 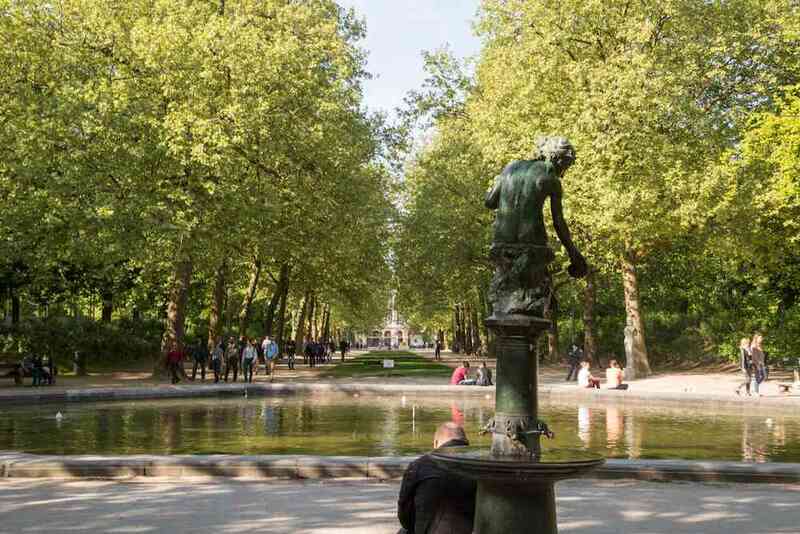 It is criminal that the number one attraction Brussels is best known for worldwide is Manneken Pis. CRIMINAL, I say. I passed right by the little baby statue and didn’t even take a picture – me, the girl whose photo archives have my poor Mac on perpetual overload – because I was that annoyed with the fact that it was the center of attention. A throng of tourists was crowded around this barely two-foot tall statue/fountain, blocking all traffic on the pedestrian intersection. 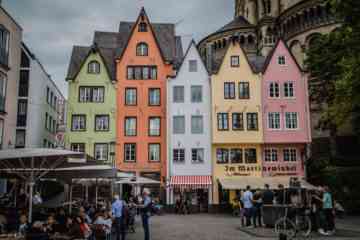 Meanwhile, beyond the crowds, laid-back cafes, gorgeous streets, cool comic-inspired street murals, and some of the best beers in the world went unnoticed. Maddening. I understood, after some time in the city, why Brussels has adopted the mysterious and odd Manneken Pis as a sort of emblem. This is a city determined to poke fun at itself, despite its somewhat serious appearance. What better representation of that than a fountain designed with a small boy relieving himself? However, there is so much to do and see in this city, that barely a second of my time was spent on the famous statue. Honestly, I didn’t expect to find much of interest in Brussels. Coming from southern Europe, the vague image of the city that had formed in my mind was of a grey, boring, stuffy place. Greeks especially think of Brussels as full of cold, suited-up bankers and EU bureaucrats shuffling to work and back. The only other time the country of Belgium had even registered in my imagination was as the birthplace of one of my favorite fictional characters – Agatha Christie’s Hercule Poirot. I don’t remember ever thinking of Brussels again with any kind of interest. Yet this is why I love travel – it often proves to me that even assumptions I have set in stone could not be more wrong. I love you Paris, but there is most definitely an attitude problem among some of your citizens towards those of us #unblessed enough to lack French skills. Belgium is divided into Wallonia (French-speaking) and Flanders (Flemish-speaking; a dialect of Dutch). Though Brussels, as the capital, is technically bilingual, the majority of citizens speak French first. I started my Brussels adventure with a walk to get to the historic center of the city. On my way, I passed a middle-aged man who smiled and said “Bonjour” in my general direction. I got a bit confused, looking around me to see who he may have been speaking to, but no – it was just me on the street. Further down, I snapped several shots of an intersection when a car with three teenagers whipped down the road. The two guys in the front flashed peace signs and smiled when they saw my camera, while the girl in the back shouted a heavily accented “Enjoy Brusseeeeeels!” out the window. By the way, there’s no way to NOT look like a tourist with a DSLR around your neck. I experienced this general level of openness and friendliness during my entire visit to the city. At a bar later that night, I ended up in conversations with four separate groups of people. They wanted to know all about life in the US and in London, exchange travel stories, and talk to me about their city pride. In addition to this extremely welcoming sense I got from locals, the population is surprisingly diverse for a city of just over 1.1 million. In addition to bumping into people from all over Europe, many of whom were working in the local EU offices, I came across people from almost every race and ethnicity on the planet within the city limits. I later learned that 70% of Brussels’ residents were born outside of Belgium. Around half of them are non-European. 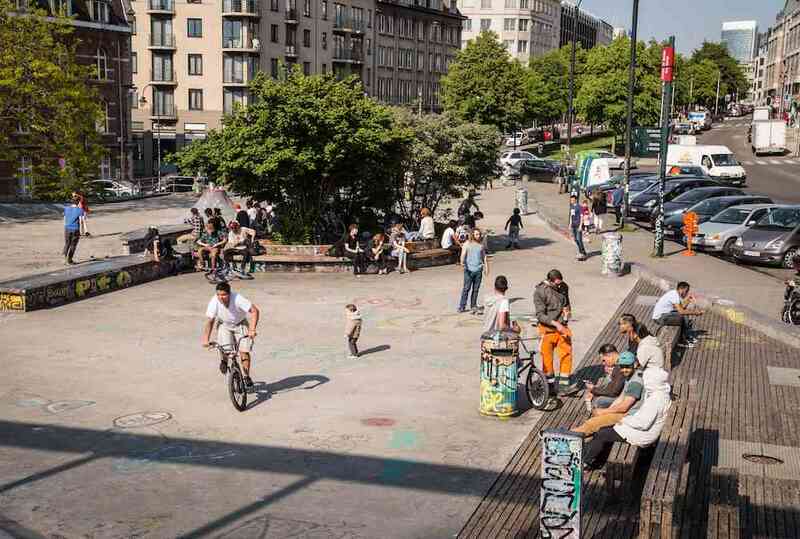 There are ethnic enclaves everywhere, with Congolese, Turkish, and Moroccan residents being some of the most well-represented nationalities in the Belgian capital. This is part of the beautiful paradox of Brussels. 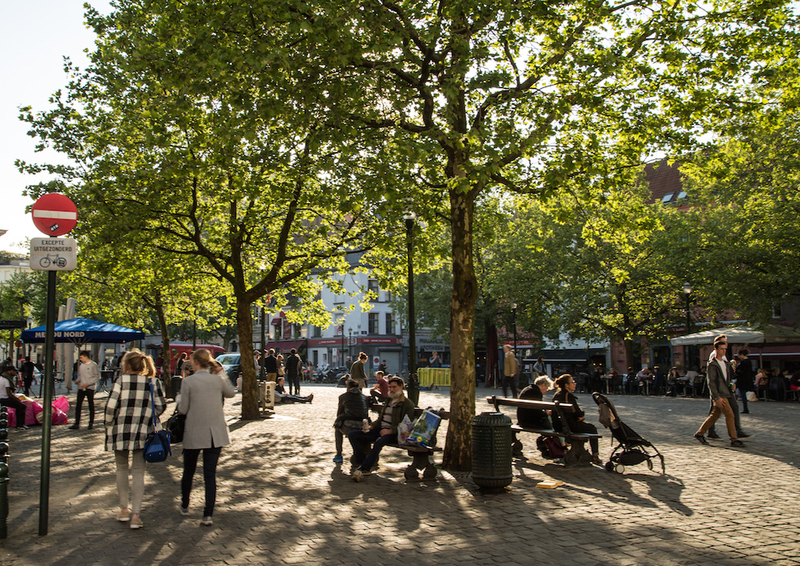 It has a small-city vibe, and is generally easily navigable (even on foot); yet it feels like there is so much to do, so many different people to meet, and such diverse neighborhoods to explore. 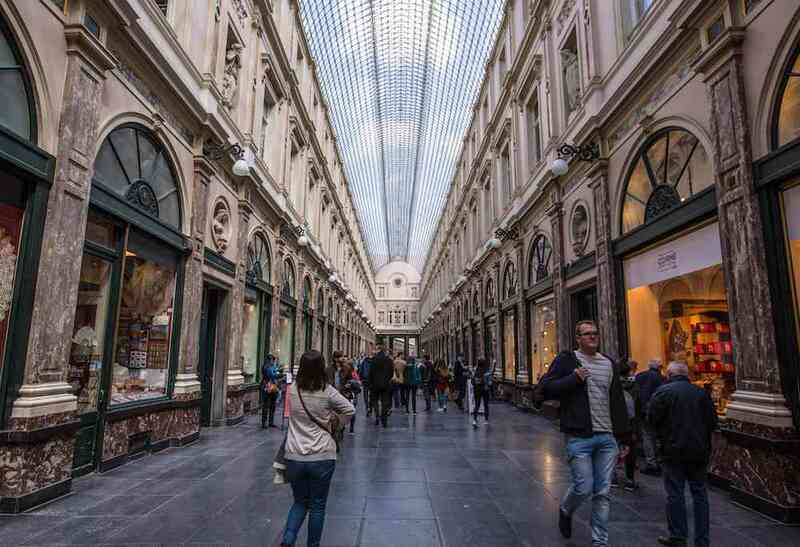 The center of Brussels is indisputably the height of elegance in the city. 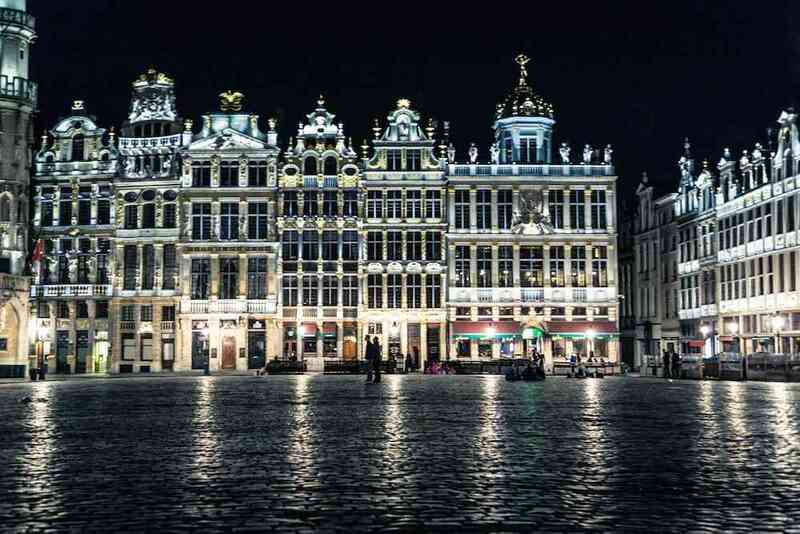 The Grand Place, which has a very old town feel to it, has buildings lined in gold. It doesn’t get much fancier than that. The locals treated the place almost like a park. I saw plenty of groups just take a seat in the middle of the square to talk or snack on the cobblestone pavement. This friendly treatment of public space makes Brussels one of the most beautiful cities I’ve visited in Europe. I love cities that seem to encourage a sense of community. The rest of the city varies wildly, though make no mistake: Brussels is rough around the edges in the best possible way. I came across several skate parks and endless rows of painstakingly drawn street art in my walks outside the center. 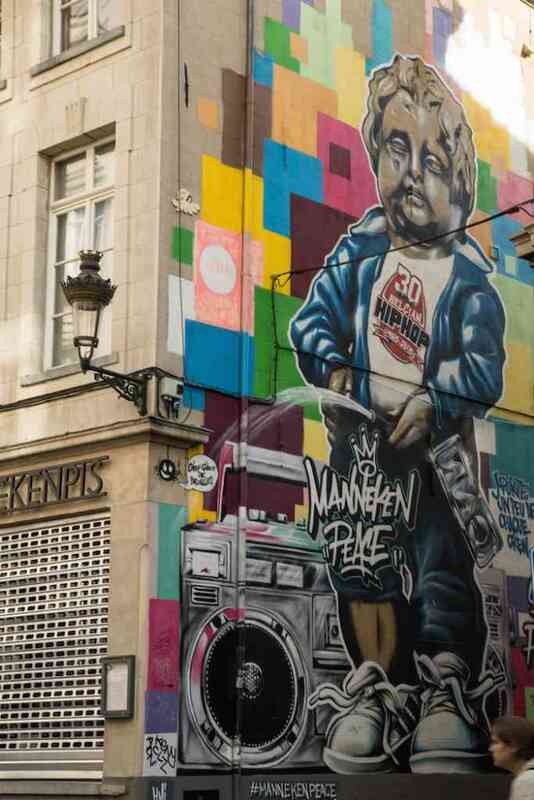 Street art of the Manneken Pis statue. I decided to take a photo of this instead of the statue itself. 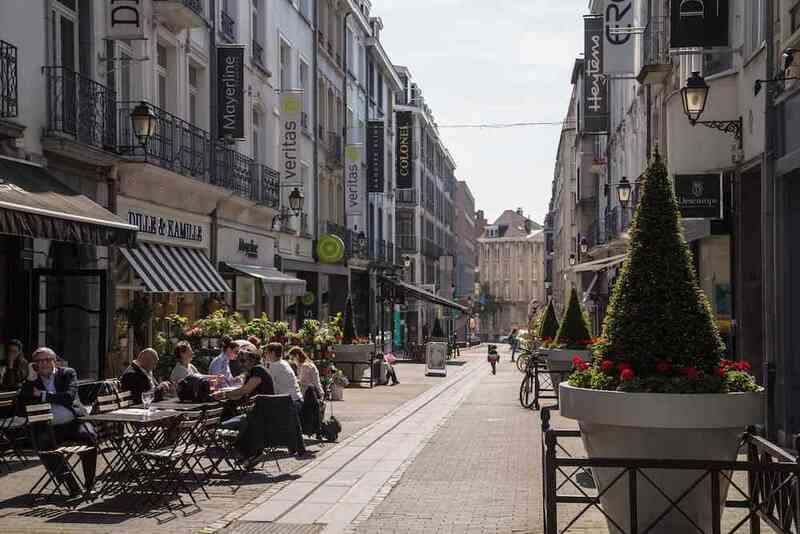 Local Tip: The neighborhoods of Ixelles and Chatelain have both quiet, residential corners and livelier, colorful streets lined with cafes and bars. I stopped at Mamy Louise for coffee and a snack outside on a warm spring day – I would highly recommend it. 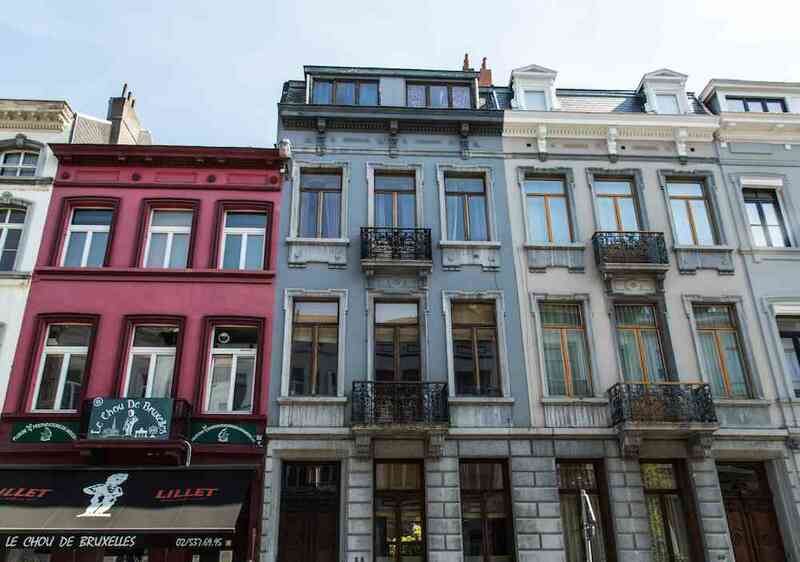 The buildings in neighborhoods like Ixelles wouldn’t look out of place in a Portuguese or Italian town, with their light colors and verandas overlooking narrow streets. It was a strange sight to behold in this northwestern corner of Europe. A row of houses in the Chatelain/Ixelles neighborhoods. One of my favorite stops in Brussels was the Belgian Comic Strip Center (Entrance: 10 Euros). Franco-Belgian comics are hugely popular and influential in the comic book world, especially in Europe. This should come as no surprise if you grew up reading Tin Tin, Asterix, or Lucky Luke (like me). The museum was highly visual and very interesting, detailing the far-reaching (farther than you’d think, actually) history of the evolution of comic books. It also delved into the process used to make them and their influence on popular culture. Several covers and illustrations of a huge variety of comics are also included among the exhibits. Full length mural of my favorite comic book series – Lucky Luke. 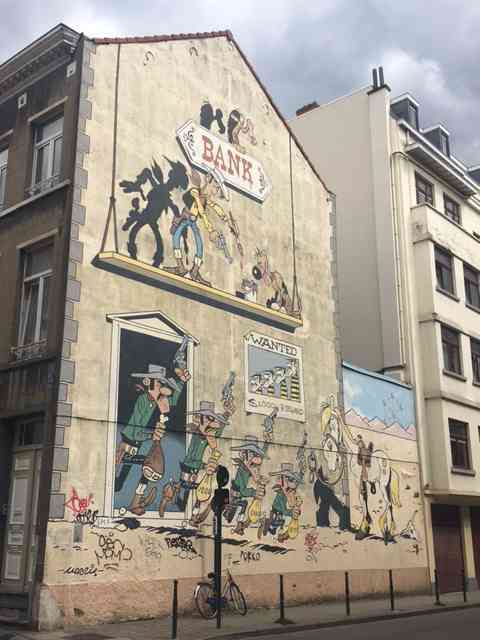 Local Tip: If you want to explore the streets of Brussels while doing a little scavenger hunt, check out the city’s comic book route, which takes you past a series of fun murals painted to commemorate famous Franco-Belgian comics. Did I mention I love this city? 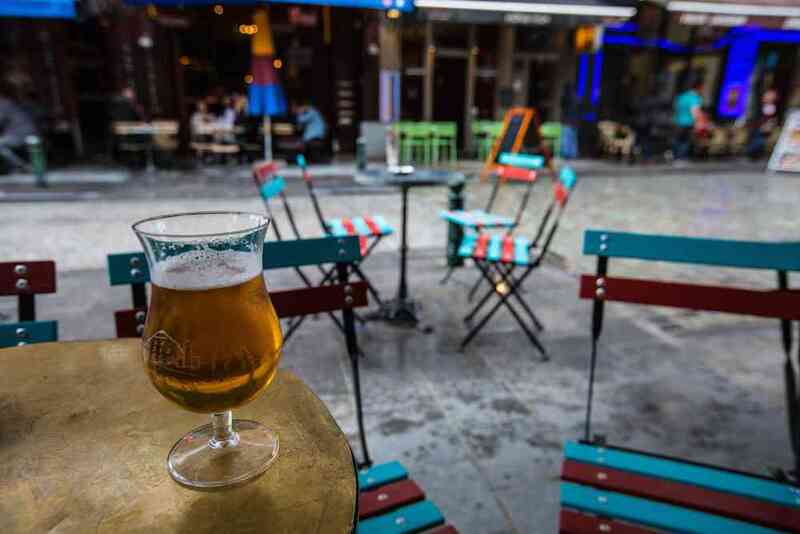 There’s no way to visit Brussels without indulging in the local beer culture. I mean, I’m sure there is a way, but it’s not a way I would choose to follow. Belgium is world-famous for its incredible beers, so a two-hour beer tour (courtesy of RailEurope!) was a welcome part of my short stay in the city. The Irish-born Brussels-based tour guide, Mick, enlightened us on the types and production of beer. He also explained how beer basically created the modern world (I always suspected). You think I’m kidding, but I assure you I’m not. 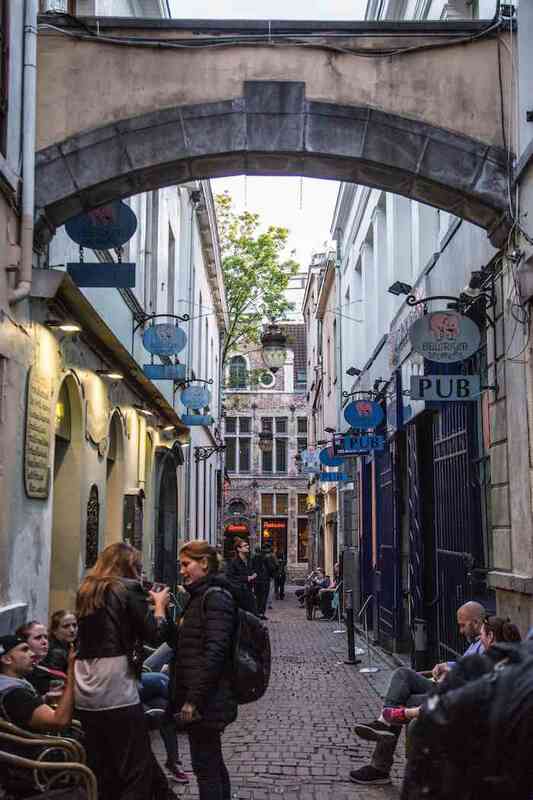 As you might imagine, this means there is no shortage of bars and breweries in Brussels. Mick enthusiastically explaining the difference between ales, lagers, and lambics. While Mick spoke to us about beer brewed by Trappist monks who survived on it for Lent – I can’t begin to tell you the crazy things I learned about this drink in Brussels – I tasted one beer after another. Five beers in, I tried to stand up in order to find a bathroom. That’s when I realized through my suddenly blurred vision that I hadn’t calculated the alcohol content accurately at all. Because Belgian beers will hit you hard. I was officially, surprisingly, drunk. Local Tip: Double and triple check the alcohol content in the Belgian beer you choose. Plenty of beers in Brussels hit a nice 9-12% range in terms of alcohol content. However, you can’t taste it easily because of the incredible quality of the beer itself. Or just drink to excess, whatever. But be smart and safe, guys. Outside Delirium bar. This gets packed at night. We visited a bar called Delirium, which I highly recommend going to at least once. It is actually pretty tourist-y but also has plenty of locals pop in at night. You absolutely have to visit if you’re a beer lover of any kind. 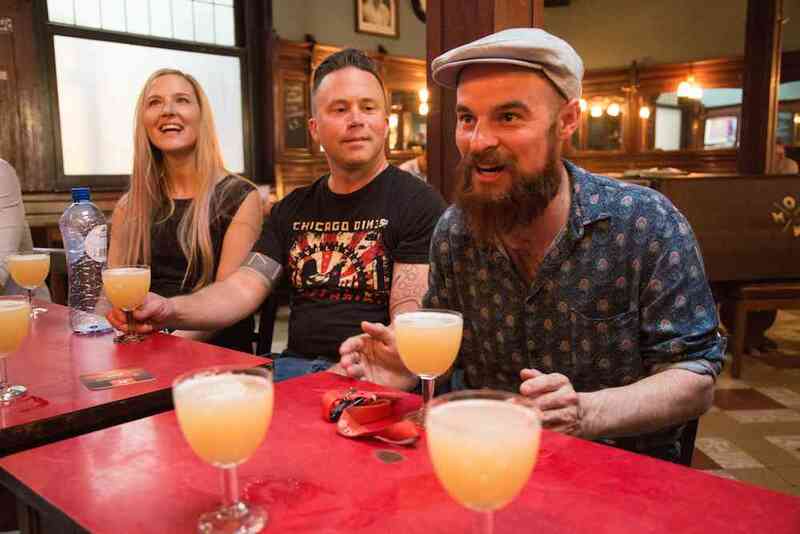 Tucked in on the side of a small pedestrian dead-end alley, this bar holds the world record for offering the largest selection of beers – over 2,000 (!). So if there’s any weird beer you’ve wanted to try, chances are you can get it here. Even though Brussels is predominantly Francophone, some northern and northeastern neighborhoods are Flemish-speaking. One of these neighborhoods, Saint-Catherine, filled with bars, cafes, restaurants, and clubs, is a great place to spend an evening. Walk around the main square or the quay, and you will be sure to find a place you like. It was incredibly strange to suddenly see signs and notices inside stores switch to Dutch. It was even stranger hearing the different speech of many people around me. What a rare phenomenon in Brussels, to have language and culture change in the span of a few blocks. 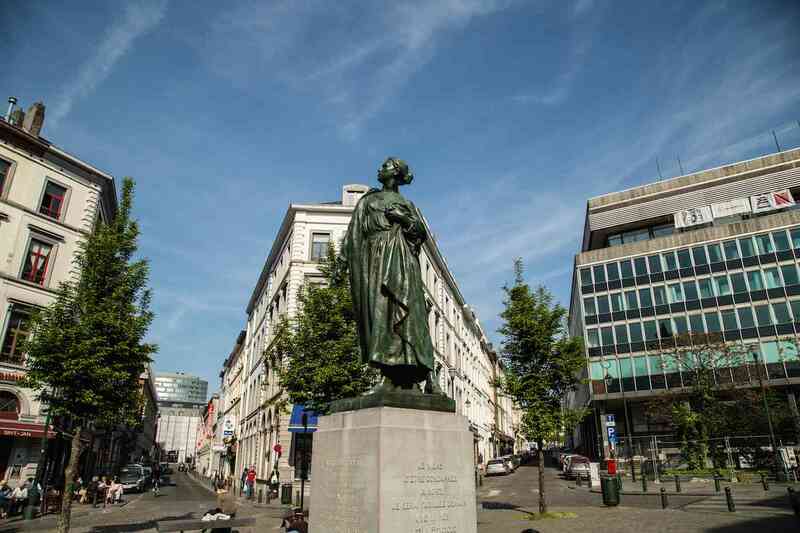 I came across statues in this area, and all around Brussels, commemorating the darker eras of the city’s history – namely, German occupation during the two World Wars. There is one particular statue made to honor the women killed under German occupation. Known as Gabrielle Petit, this artwork truly moved me. Gabrielle Petit was a real person, a Belgian woman who spied for the British Secret Service. She was found out and paid for her heroism with her life. I don’t know if it was the defiant pose of the woman or the inscription of words that are so mind-blowingly brave right below her, but something about that statue stopped me in my tracks. Other, quirkier remnants of the years of occupation exist throughout the city. A bit further from the main streets of Saint-Catherine lies a cocktail bar (and later in the night, impromptu dance club) called L’Archiduc. It’s a charming jazzy nightlife venue that attracts a somewhat older crowd than most – many dancers were in their 30s and 40s – and seems a little out of time and place. The reason behind this is actually quite incredible. As one of my local friends told me, this Belgian club established in the 1930s was used as a Nazi hangout during the occupation. The owner was part of the resistance and reported a lot of the info she overheard to Belgian rebels. After WWII, the venue continued to operate as a cool, successful bar. Eventually, the owner insisted it had run a good course, so she would rather close it than sell it at the end of her life. However, a long-time customer loved L’Archiduc so much that he insisted on buying it. The owner eventually sold it off under the stipulation that he wouldn’t change a thing. As you can see if you visit the bar today, he has not. Local Tip: Visit L’Archiduc on a weekend night to dance until the wee hours of the morning if you so choose. In a way, off-duty professionals dancing to nostalgic hits from the 90s and 00s in an untouched 1930s jazz bar perfectly reflects my perception of Brussels – mashed up sensibilities in an elegantly old, yet idiosyncratic and lively place. This overlooked city hosts an amazing foodie scene that ranges from Michelin-star restaurants to delicious local street fare and dishes. 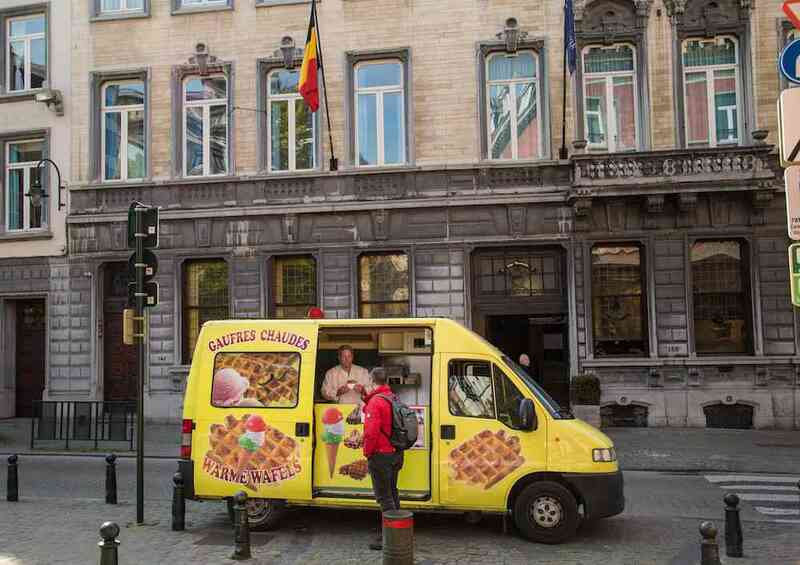 Stops for Belgian chocolate and waffles are a must – if you are lucky, you can even find food carts selling waffles around town. As you can already tell, these staples of Belgian cuisine aren’t going to help you slim down any. But really, you shouldn’t care. For an extra treat, try the local fries as well – pommes frites. They are usually served in a cone with sauce on top. I had just traveled from Amsterdam to Brussels, and I finally realized that fries slathered in sauce are somewhat of a regional delicacy in northwest Europe. Local Tip: Try moules frites, a mussel and fry dish that will obviously make it hard to fit into your bathing suit, but is nevertheless quite delicious. 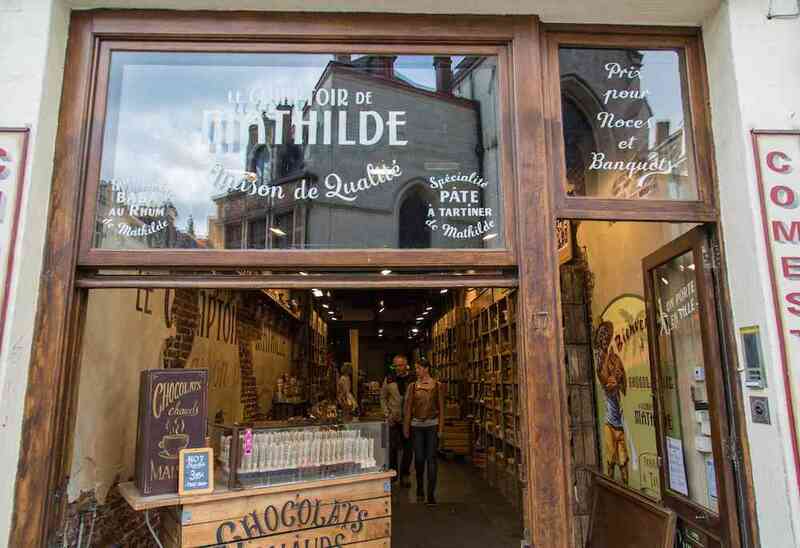 The locally produced chocolate is amazing almost everywhere, but I especially loved the chocolate I tried at Le Comptoir de Mathilde. P.S. I was taste testing chocolate across Brussels for you guys – I hope you appreciate my effort, dear readers. 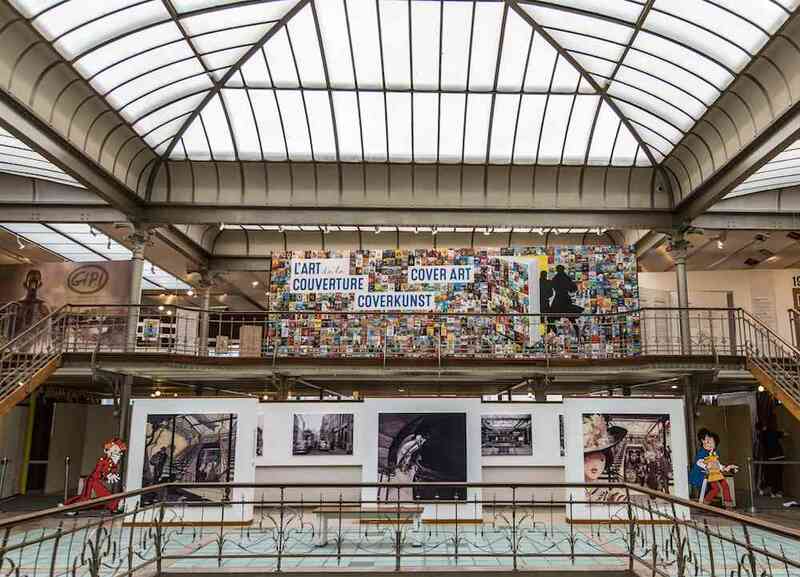 Besides commemorating the art of the comic, Brussels has plenty of museums dedicated to art, photography, and architecture. I stopped at Bourse de Bruxelles (the Brussels stock exchange) to check out an exhibit from one of my favorite photographers, National Geographic legend Steve McCurry, and found both the setup and the photos mesmerizing. The stock exchange regularly hosts new art exhibits and events, so check out the Bourse schedule when you’re in town. Fans of the offbeat will definitely want to stop by the Atomium, a little further out from the center of the city, while those who want to explore Brussels’ understated but gorgeous Art Nouveau architecture should stop by Musee Horta, the former home and studio of Victor Horta, the father of Belgium’s Art Nouveau movement. If you want to shop (not my specialty at all), check out Galeries Sainte-Hubert. I can’t tell you much about the clothing selection due to my shopping aversion. However, I can tell you it’s a cool space to walk through. I don’t know why Brussels doesn’t attract the number of visitors other picturesque European cities do. 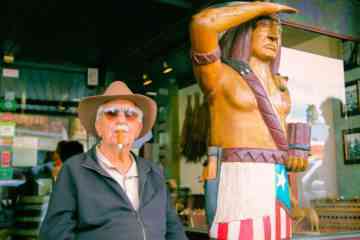 However, I can tell you that you will eat well, drink well, and meet plenty of cool, friendly locals. 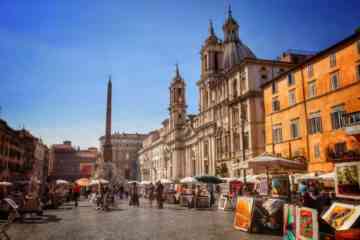 You will also find lively, edgy neighborhoods among the more elegant, quiet streets that you can easily spend all day exploring. Not to mention you can do all of this for less money than you would spend in London or Paris. Brussels intrigued me – I felt an undercurrent of life, a sense of fun, a quirkiness there I never expected. It took me by surprise and led to an enchanting couple of days in the unusual Belgian capital. This was, of course, followed by a nagging desire to go back as soon as possible. 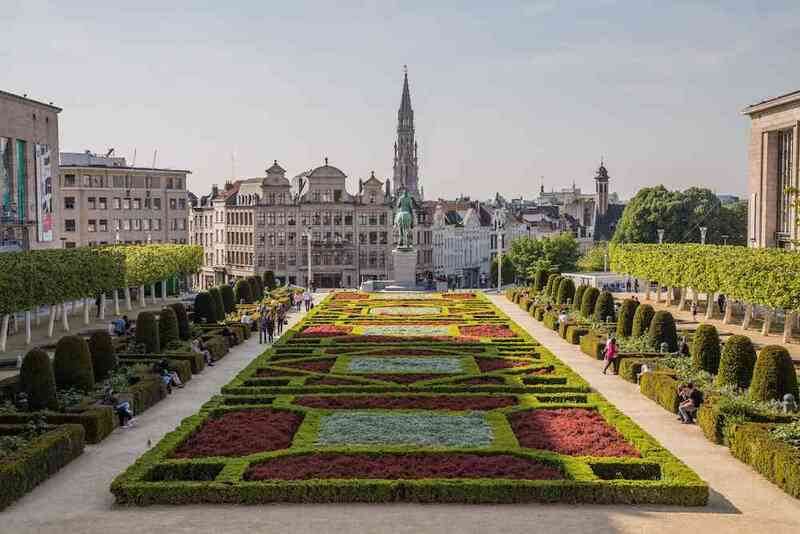 So if you’re looking for a new great European city to explore – Brussels should definitely be next on your list. I went in May, and I would definitely recommend late spring/early summer as the best time to visit Brussels. It is one of the coolest cities in Europe, in what I find to be one of the most underrated European countries as well – Belgium. 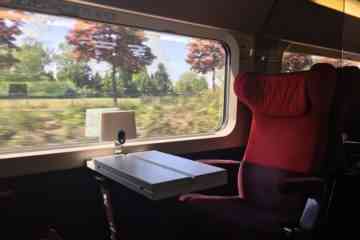 For a story of the role of privilege in travel, read my story of another traveler’s experience compared to mine on the train to Bruges from Brussels. 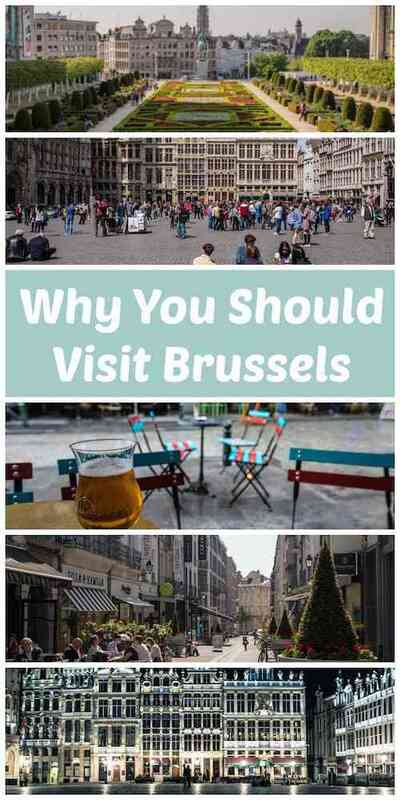 Want to Visit Brussels Yourself? If you want hotels easily accessible from the airport of Brussels, check out these central hotels! First time in Belgium? 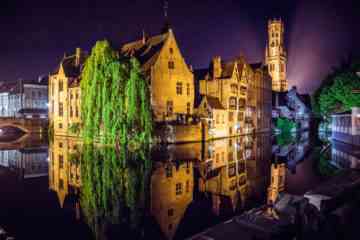 Decide on Bruges vs Brussels by also checking out my Bruges photos! What do you think is the most underrated destination you’ve been to so far? Comment below! And if you liked the article, pin away! When I was in Belgium, I only went to Bruges but Brussels looked so cool from the train! 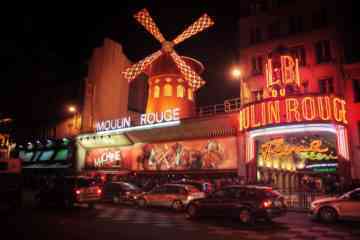 I would love to visit it. Especially that cool jazz bar! Yes, you fell under the brussel’s spell hehehe. This spell keeps me coming back every year. For me is easy because I live in Spain so it is only 2h from Madrid. Why people prefer other citys I dont know but for me is ok, lets keep this gem hidden as long as possible hehehe. Haha I completely agree! Not too many people need to find out. This was a great article! I love how you give historical information on the sites and neighborhoods and not just-eat beer and chocolate. I am doing a day trip to Belgium from Paris and in torn between Brussels and Bruges! I realize I need to make a separate trip to Belgium to explore all these great places! Completely! I realize I need to get back to Belgium and spend more time in Brussels plus see other cities like Ghent as well!